If you are interested in sharing SoulCollage® with others, and to widen your understanding of what your personal practice can do for you, please join us, you will be most welcomed. The Trainings have been described as informative and transformative experiences. Many participants remark that the program exceeded their expectations. This is a unique opportunity to train with Mariabruna, in Italy, in English! 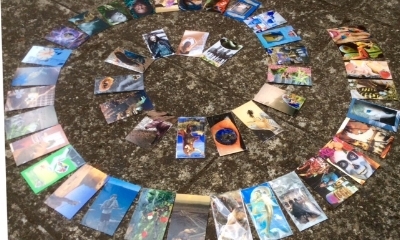 The Training is designed to prepare participants to share SoulCollage® with others through groups, workshops, classes and other professional applications. It delves into what it means to be an effective Facilitator, it explores ethical and technical aspects, and it offers several hands-on experiences that support the deepening of one's practice and the understanding of what this method can do when applied appropriately - several of these activities become templates you can apply in your facilitating work once completed the program. The more prepared you are the more benefit you will gain from the Training. This is a program meant to prepare you to facilitate the method, not to learn it. Please, take the prerequisites seriously and enable yourself to take full advantage of your investment in becoming a Facilitator. You will be glad you did. The Location: within the medieval walls of Tuscania. Exact directions will be sent upon registration. There is a 40% discount for returning Facilitators who are active Circle Members. CEs for California and some other States are being offered; the fee is $25.00 plus PayPal expenses. A request including detailed information regarding your license must be received one month ahead of the Training. Please email: elf4mb@gmail.com. What to bring: extra snacks if you need to munch in between meals; water bottle; your pen and journal. Optional: your scissors, a glue stick, any magazine you are willing to share, any images you might have already saved. If you are flying let us know and we will make sure you will find all you need here. Wear comfortable work clothing and bring a shawl if you like to work on the floor. Wear shoes good enough for walking in the village. Please do check Airbnb and booking.com to find your favorite Tuscania nest! There are many more than the ones listed below.